I wrote a couple days ago about being shot at in my car, and obviously it's been on my mind quite a bit since then. For a few years now, I've considered carrying (concealed, for the most part) my own pistol, but have always stopped short. There are the moral and legal responsibilities—burdens in their own right—that correctly require intense attention and consideration. There are also issues that could be characterized as logistical—things like physical comfort and mindfulness of restrictions and prohibition of weapons. And probably most importantly, I don't harbor grandiose ideas of myself as some kind of superhero or cowboy gunslinger. Guns are serious business and the decision to carry is a solemn one. But over the last week, I've also thought more and more about what could have happened if my car had become disabled, or if I'd become trapped by traffic or other obstacles. I've thought about what could have easily happened to me, and to my partner in the passenger seat. The thought of sitting in my car and being executed like yet another road rage statistic is not acceptable to me. The larger conversation about these issues can be really frustrating for a liberal gun owner. The poster children held up to represent gun owners are people like George Zimmerman—people with some kind of mall-ninja/wannabe-cop complex who don't have any business owning firearms, let alone carrying them. But there are a lot of us out there for whom our desire to carry is motivated by some degree of fear—the same fear that drives us to flee danger whenever possible, and to face it and fight only when no other option remains. I hate the way that the argument is reduced to "sheep" on the left and "gun nuts" on the right. One is eager to be slaughtered and the other is eager to slaughter. What becomes of the rest of us in the middle? 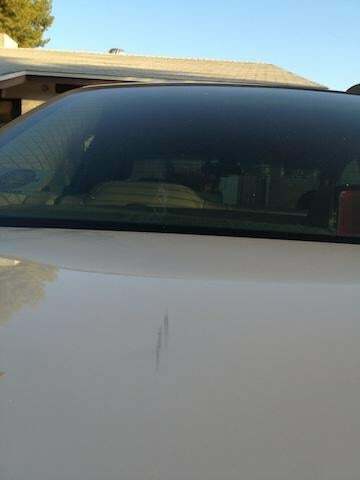 *Photo above shows where the bullet left a streak of lead on the trunk lid before impacting the bottom of the rear windshield and disintegrating. Note the trajectory heading directly toward the driver seat. It's a little surreal how lucky I am, and I can't help but feel extremely blessed.